What Causes a Sea Breeze? My first solo offshore passage began with sunshine, gentle breezes and easy sailing. But there was nothing gentle about my return to land at day’s end. My first solo offshore passage was marked by sunshine, gentle breezes and easy sailing. But there was nothing gentle about my return to land. Tempestuous head winds stilted my landfall as my little boat crashed through waves. By the time I was nearing the entrance to the harbor, the sky had turned to night and there was no light to guide me through the channel. I was tense as Daphne raced between the rows of channel markers, inconspicuous in the night. Safe in the harbor, I breathed a sigh of relief and decided that my next landfall would be in the daylight. But it wasn’t just the darkness that made the landfall difficult that night. It was equally the strong headwinds. So, I also thought it would be best to make landfall with favorable winds and it just so happens that a sea-breeze often brings favorable winds for making landfall in the day. A sea breeze is a local wind, independent of global wind patterns such as the Trade Winds or Westerlies. But like the Westerlies and most winds, they are named for the direction from which they flow and the sea breeze flows from the sea toward the land. Sea breezes affect the area along a coast and can extend as far as twenty miles offshore. Like all winds, a sea breeze is formed as a result of a change in temperature and air pressure. The primary cause of all winds, global or local, is the difference in air pressure. Air will naturally flow from areas of high pressure to low pressure. Think of a balloon at a birthday party, for example. A balloon filled with air has higher pressure inside the balloon than the air surrounding it. When the balloon’s knot is untied and the balloon is released, the air quickly rushes out. A sea breeze is created when a low pressure forms over the coast. The sea has a greater heat capacity than land, meaning it requires more heat to change its temperature. 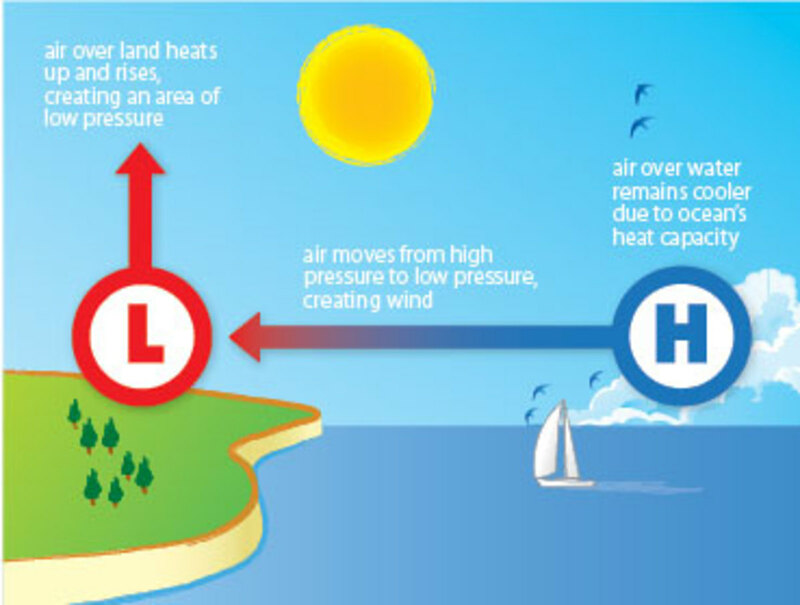 Therefore, during the day, as the sun’s warm rays shine down on the earth, because of the difference in heat capacity, the land heats up faster than the sea. The air above the land also warms. Since warm air is less dense than cool air it begins to rise, leaving an area of low pressure just over the land. The sea breeze is created when the cool air over the sea rushes in to fill the low-pressure region making a favorable wind for making landfall. Another benefit of this cycle is that the warm air rising often forms puffy cumulus clouds over land. Out at sea, these clouds can be an indicator for the island destination you are looking for long before the island itself appears above the horizon.